Fall is so close I can taste it. The spiders are fattening up..which is a sure sign that summer is nearing it's end here in northwest Oregon. The weather has dramatically changed in the past day and we are in store for rain and blustery weather. 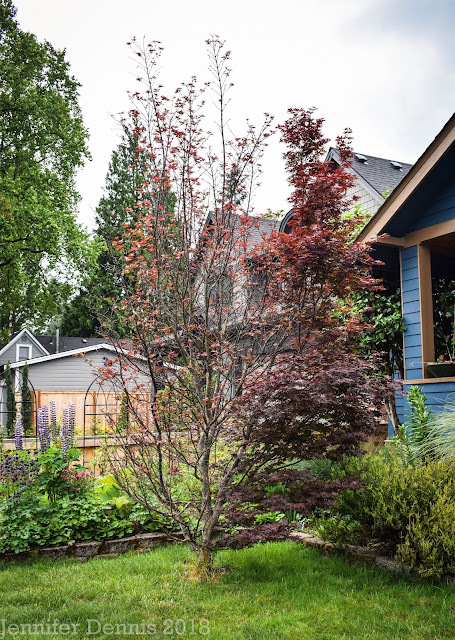 It's time to reflect over the blooms that made it through the hottest summer on record. 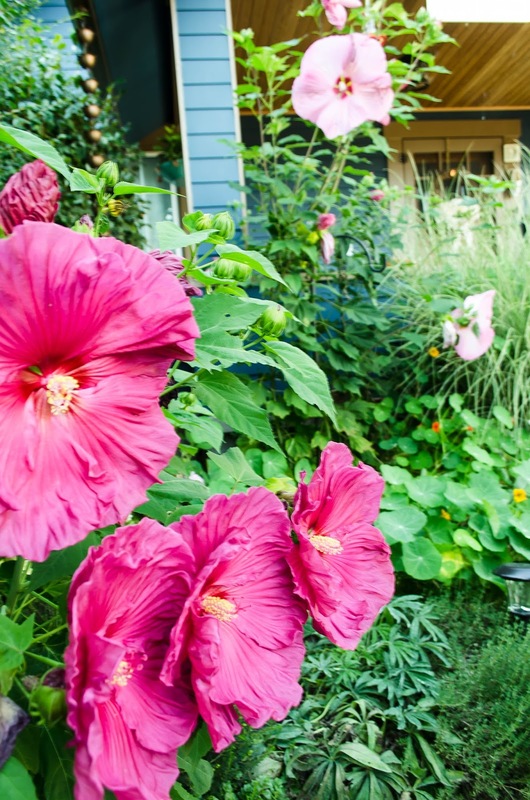 The showstopper in my front gardens are the hardy hibiscus. I have two varieties....currently. Tall and dramatic hibiscus moscheutos 'Pink Cloud' had so many flower buds this year! Alas, a weird late August wind storm knocked down many of the branches. Sometimes you just can't seem to win. 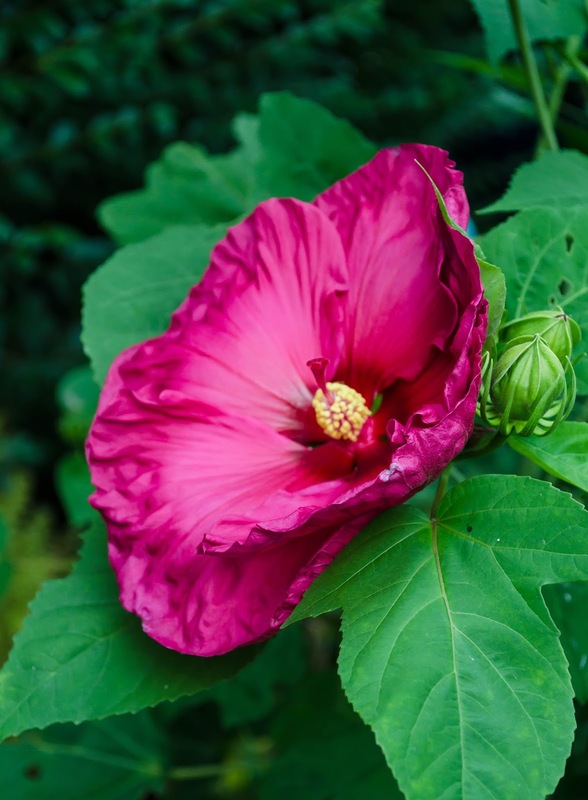 The deep, magenta hues of hardy hibiscus 'Jazzberry Jam' really stand out. It's a shorter, more bush-like hibiscus compared to the tall 'Pink Cloud' but the color is so intense. It's a perfect hue to illustrate how the end of summer feels. 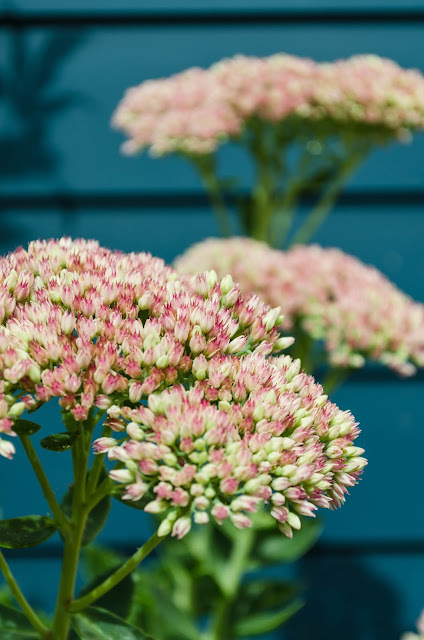 Sedums are a favorite in the September garden. I have a little trouble keeping them up right, so putting them in containers has been awesome. In the back. my first hollyhock blooms have appeared. This poor plant has had quite the journey. I started it from seed 2 years ago. It sat in it's little pot for a year, then last year, I planted it somewhere that wasn't the right spot. This spring I dug them up and re-planted them. They grew..but the aphids went wild on them and this one pictured is the only one to survive. It was not a good summer for hollyhocks in my garden this year. Cape fuchsia's were a big winner in my garden this year. They survived the heat and no rain with flying colors. They get bigger here than their descriptions say as well...so the trick to loving them is to prune well! I am trying to keep the larger canes intact so they become more robust and sturdy..which keeps the blooms aloft for the hummingbirds to enjoy. And finally, my cottage garden would not be complete with out a few dahlias. Mine suffered this year as they were kept in pots.... I didn't get around to building that new flower bed this spring but they still produced some splendid blooms. Pictured above is my son's favorite. He's nearly 10 and thinks a flower name with the word 'Dragon' in it....is pretty cool. Ha! Swing by Carol's blog 'May Dreams Garden' and see what is blooming around the world. 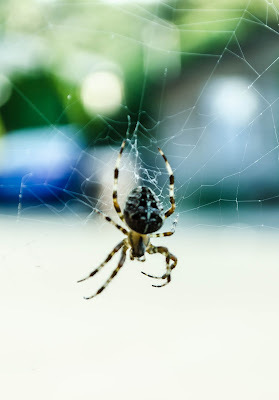 An Orb weaver spider , I've been googling my spiders, to help me feel more comfortable with there being so many about. It's European and not dangerous…phew. My Hollyhocks get rust every year, and self seed quite a lot . I think I'll try a different one next year. Your hibiscus are drool-worthy! So gorgeous. I bought H. mutabilis from Annie's recently. Not that I needed another one, but you know how it goes. 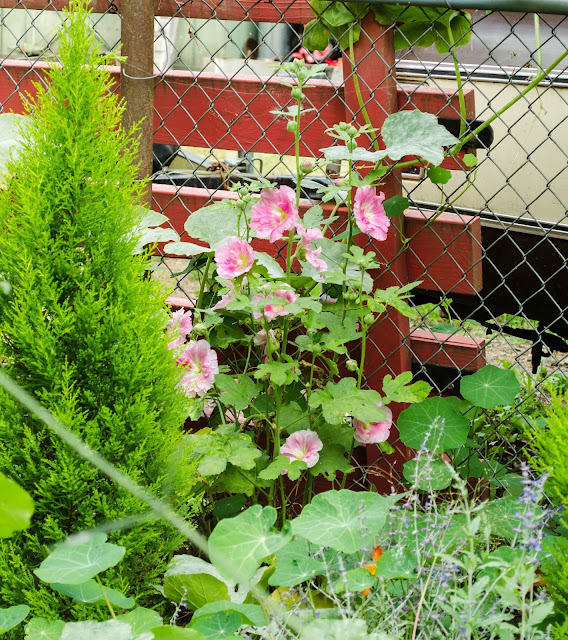 Your Hollyhocks look fantastic. You'd never know they'd had such a perilous journey. Good tip about the Phygelius. 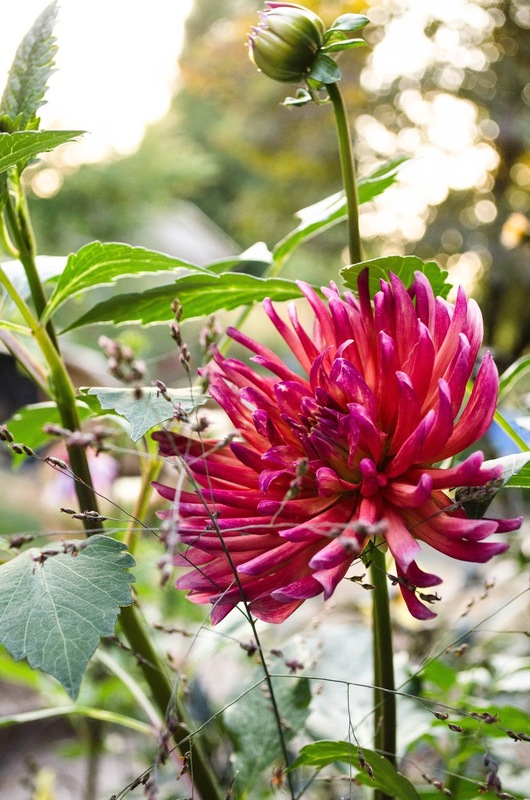 And that Dahlia is stunning. I love the coloring and the mingling grass flower. Lots of those cross spiders in my garden too. I leave them alone for the most part, as long as I'm not blundering into their webs. They don't try to come into the house, ever. 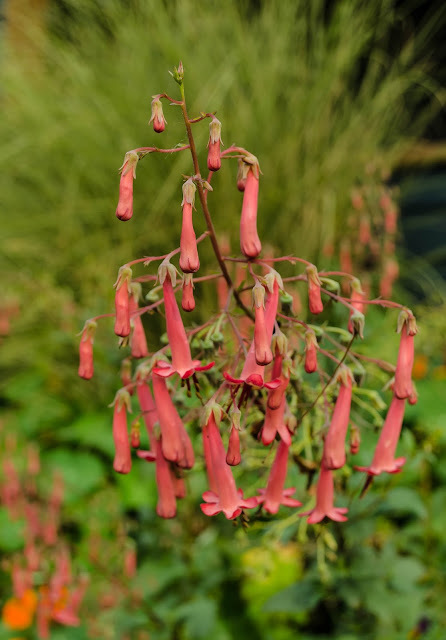 I need to buy a Phygelius, your recommendation for its heat and drought-tolerance makes it a winner in my book. We call those spiders, garden spiders. The heat isn't something we have had to worry about here mum is a lack of it. I can't pass up a plant with "dragon" in its name either...or "devil" for that matter. Hoping my 'Devil's Tears will grow up to look like yours. Ummmm "oh stunning flowers" she thinks as she quickly scrolls down past the spidy shot...lol. Very beautiful...well except for the eight legged creature. Not that I hate them, I just need a warning, being spider phobic and all that. I've got the chestnuts drying outside the front door hoping to discourage them from invading my territory...we will see.